Happy Autumn, Nerfherders! We’ve got a special guest on the show this week: Dan from the Discography Discussion podcast! 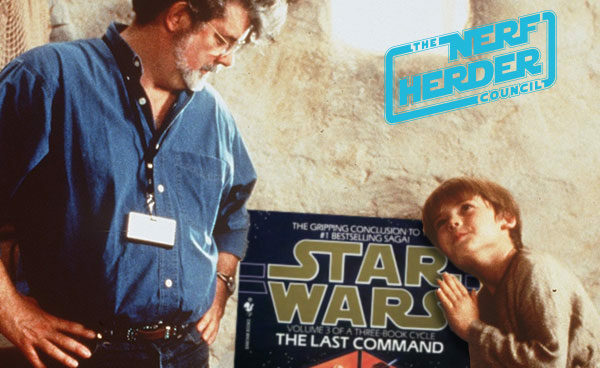 Amazingly enough, his first exposure to Star Wars came by way of the now-Legends book The Last Command on audio cassette – meaning the original trilogy became a prequel trilogy to him. We get his takes on the prequels, George Lucas handing off the franchise, the eternal “Han shot first” debate, and much more! Also in this episode, the Council give their takes on the announcement of J.J. Abrams coming back to helm Episode 9 – and as usual, Jon is wrong opinion is divided! Check out the Discography Discussion podcast on Podbean!